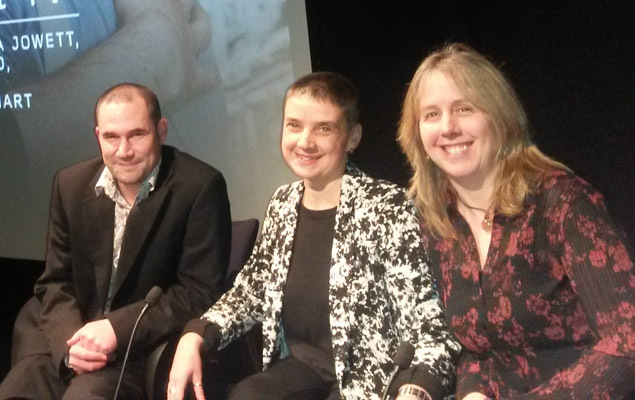 UoN’s Dr Lorna Jowett was part of an expert panel at the British Film Institute last November for an event entitled Gays of Fear and Wonder: Queer Sci-Fi TV, as part of the BFI’s science fiction season. The event, sold out over three weeks in advance, had over 100 participants in the audience and Lorna was joined on the panel by the University of Roehampton’s Stacey Abbott, and Ewan Kirkland (University of Brighton). Lorna and Stacey are no strangers to working together, having co-written the book TV Horror: Investigating the Dark Side of the Small Screen (2013) and co-organised the TV Fangdom series of conferences along with UoN’s Michael Starr. Each panellist gave a short 10 minute presentation, including a clip of their choice, and a wide ranging discussion about science fiction TV followed, covering not only LGBT characters but also audience responses and production issues. “The large turnout for this event demonstrates a lively interest in television and how it can tackle issues of representation differently to cinema,” Lorna commented.